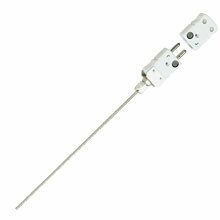 Find how Thermocouple probes work on this link. Super OMEGACLAD™ XL is highlighted in yellow and is available in Types K and N only. Nota: † Other lengths available, consult Sales Department. Note: Inconel sheath not available in 0.25 mm O.D. with type T. To order with 321 stainless steel sheath, change “SS” in model nunber to “321SS” No add’l cost.